Two more pictures of old Wayne, received by this writer from Harry B. Buten, of Merion, are shown in today’s column. Although each is labeled “corner of Aberdeen and Midland avenues,” it is quite obvious, to one as familiar with Wayne as is the writer, that the views have been made from a point on the west side of Aberdeen avenue, about midway between Midland and Windermere avenues. In the picture with the waterfall in the foreground, the camera has been focused to the northwest, while in the other it has been to the southwest. The picture from which the two postcards were made are now more than 50 years old. This full half-century has brought little change in the scenes except that their vistas have now been somewhat obscured by the growth of trees. Several landmarks, such as the spires of both the Presbyterian Chapel and of the Presbyterian Church which show clearly in the waterfalls picture, are now obliterated by these trees. The entire plot of ground extending along Aberdeen avenue from Windermere avenue to Midland avenue is now the property of St. Katharine’s Church, having been purchased in 1917 from Emma B. Mallon, as a residence for the Sisters, members of St. Katharine’s School faculty. This house, the present convent, does not show in the picture, although the building directly to the rear of it, which was originally used as a carriage house and stable, looks today just as it did 50 years ago in the picture. From his old records in the township building, T. Griffiths Roberts has ascertained for this column that the house in the center of the picture was occupied at the time by the Scofield family. Others to the west in the same block were the Betts’ house, the Bucks’, the Badgers’ and the Conners’. Mrs. W.H. Badger is still living in the house at 211 Windermere avenue, into which she and her husband moved in 1901. 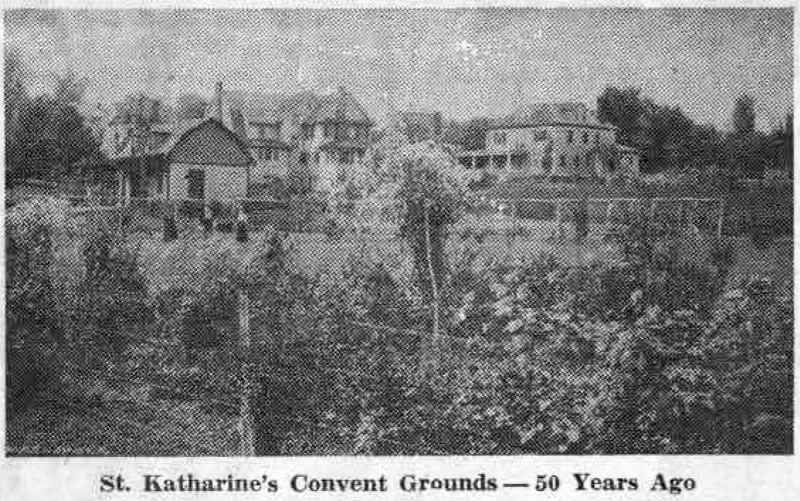 The beautiful grounds which lie back of the Sisters’ home have changed very little in the years that have passed. The stream still flows under a rustic bridge, which is, however, a successor to the one in the picture. The path which crosses the bridge leads to a point on Midland avenue directly opposite the parochial school where the Sisters teach. And as the years turn back for this writer to the time when her children trudged home along Midland avenue from the Radnor township schools, she wonders if the present day children from these schools sometimes still wander into these grounds and fall – intentionally or otherwise – into the stream that goes over the waterfall. In the April 8, 1949, Issue of “The Suburban,” when this column made its fifth appearance, there appeared the first reference to the handsome building so clearly portrayed above. It has taken almost eight years for this illustration to come to light. 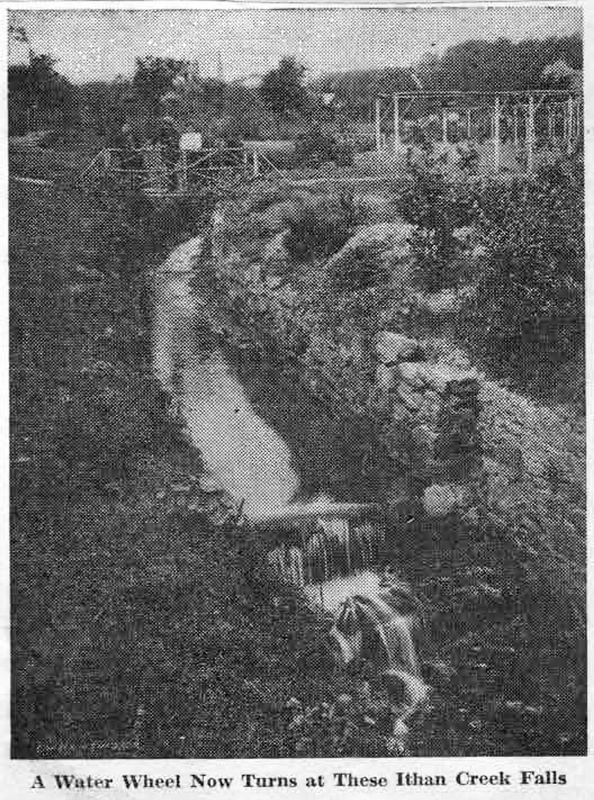 The original is a postcard picture given for use in this column by Harry Buten, of Merion. The spacious Merryvale Cricket Club, as the Radnor Cricket Club was first known, was erected in the 1880’s. It stood in North Wayne, near the track of the Pennsylvania Railroad on ground now used as a playfield by the Radnor Township Schools. Directly adjoining it was the original North Wayne fire house, now headquarters for the American Legion Post, and easily identified in the picture. 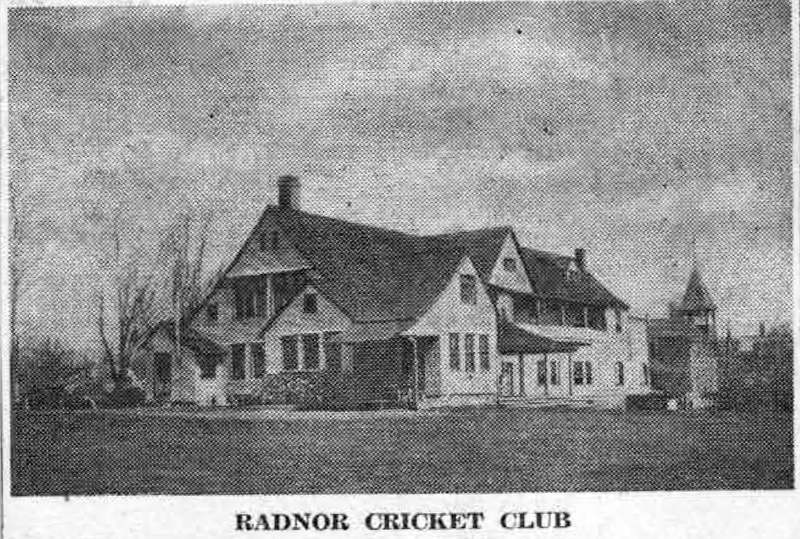 The Radnor Cricket Club has a baseball diamond and a board backstop surmounted by a pavilion, reached by stairs from the rear. The club also had two tennis courts, a room for billiards and a bowling alley. From the original Merryvale Cricket Club there later developed the Swimming Club, located at the famous Kelly’s Dam in North Wayne, and the Bicycle Club, with headquarters on Lancaster pike. Later still came the organization which was eventually to develop into the present St. Davids Golf Club. However, the beautiful club house erected by the Merryvale Cricket Club was not to see many years of gay parties and outdoor sports activities. Catastrophe struck it in the form of a disastrous fire which burned it to the ground only a few years after it was erected. The charming club house was never rebuilt.